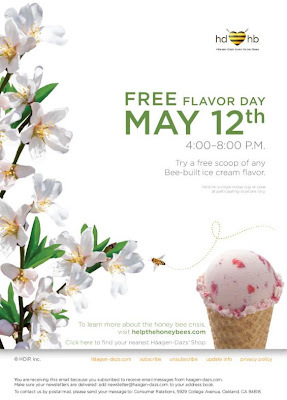 Free Scoop this Flavor Day (May 12, 2009) from Haagen-Dasz! No catch but the appeal of sweet ice cream. You'll probably have to confirm that the location you plan to head to is serving up the free scoop on Flavor Day. Apart from that bit of due diligence for your sweet-tooth, all you have to do it get the scoop in a cone or cup and enjoy it. Sweet deal for some honey ice cream. One free scoop per customer. Free item includes one single-scoop cone or cup. Offer valid on Bee-built ice cream flavors at participating locations only. Only Valid Today: May 12, 2009 from 4pm to 8pm. We at Qmania love hearing about great deals and spreading the word on the truly buzzworthy. What could be more buzzworthy than bees? Good play Haagen-Dasz. Good play.